Because of the vision of our club members, numerous projects have come to fruition and our community has clearly benefited. In addition to our Community Improvement Projects, club members have inspired Award-Winning Community Outreach Programs including: the annual Thanksgiving Food Drive, Holiday Gift Drives, and countless Home Life Projects. Club members donate new clothing items for children of families who are in need. Committee members work with school nurses to create and coordinate personal wish lists. Families are kept confidential by the school nurses. Local senior citizens have benefited from our Easter Basket and Valentine's Day projects. Clubwomen shop for essential items from personal wish lists. Please contact us if you would like to make a donation to this project or any of our other Community Outreach Projects. September-November 2018: Step Away from Abuse Sock Collection the Club donated to Family Services of Blair County. Members of the club and High School volunteers help organize the donations. The Annual Food Drive is held the weekend before Thanksgiving. The food drive is a three day event. Last year's event was held on November 16th-18th, 2018 at Sam's Club and Walmart in Altoona. Club members collect nonperishable food items. Donations are distributed to local food banks and other organizations located in Hollidaysburg and Altoona. Our project list would not be complete without mentioning our current Community Improvement Program - The Kid's Kingdom Play Park and Canal Basin Park Renovation Project Phase I and Phase II. Since this project was such a huge undertaking, it was divided into separate phases. 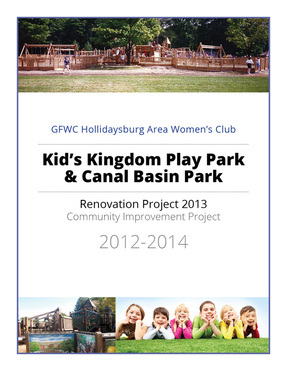 Please visit our Kid's Kingdom Play Park page to learn more about our GFWC HAWC Award-Winning Community Improvement Project! The Discovery Garden was created in memory of Courtney Leigh Claton, who passed away unexpectedly in 1997. The garden was developed from donations made to The Skills Foundation in her memory. In 1998, Courtney's mother, Karen Claton, a 20 year member of our Club, began coordinating the garden after suggestions made by employees of Skills. The Discovery Garden was dedicated on September 17, 2000, with the help of friends, family, and members of our community. The Discovery Garden features seven unique themed gardens including the Children's Garden, sponsored by the GFWC Hollidaysburg Area Women's Club. Our Clubwomen were part of the original Steering Committee working on design elements for the Children's Garden and the theme gardens. We celebrated the 15th Anniversary of Discovery Garden in 2015! Clubwomen and other community members who share the love of gardening and those who just love the garden, volunteer their time on Thursdays at 9AM April through October. No gardening experience necessary. Clubwoman, Leslie Smith, continues to work with the Hollidaysburg area schools conducting educational tours and planting annuals. The students learn about the fragile nature of ecosystems and respecting and caring for the garden. Students also learn about various types of plants and trees, pollinators, beneficial insects and garden pests, the life cycle of the butterfly and plants needed to sustain caterpillars. They also learn about the sundial and sun time as opposed to clock time as they view the largest horizontal sundial on the east coast. 183 students enjoyed this program during the spring of 2014. Support the Discovery Garden by volunteering or attending the Plant Sale held annually in May. Beautiful plants and garden accessories are available.